Ansel Adams (1902-1984) had one of the great, productive lives in the history of photography. He is usually thought of as a landscape photographer, a maker of images that blended the contemplative and the dramatic. Adams lived, however, through turbulent political times and was deeply involved in issues that did not have a broad support base at the time. He addressed environmental issues throughout his life and was instrumental in the creation of the Sierra Club. In February 1942 the US government, following Canada’s lead, incarcerated its entire Japanese American population living west of the Mississippi River. This forced relocation of people who had been hard-working, patriotic citizens only a few months earlier, directly affected 115,000 people by depriving them of their rights and their possessions, including real estate and businesses. The internment camps for the Japanese Americans were scattered around the US west, in Arizona, California, Idaho, New Mexico and Colorado. Conditions in the camps varied widely, with Tule Lake, California considered to be the worst, and Manzanar, the subject of this exhibition, perhaps one of the best. In 2003, at a time when internment, incarceration and quarantine are daily news, this exhibition provides an opportunity to reflect on the nature of forced separation and uprooting and the effects that it has on its victims and the communities that are fractured by the uprooting. Adams was incensed by what he heard about government policy toward Japanese Americans and set out to photograph life at Manzanar War Relocation Center as objectively as he could, and at his own expense. The resulting photographs of daily life at the Manzanar camp are stunning in their directness and remain some of the most moving documents of internment ever produced. They were first published in the book Born Free and Equal in 1944. The book had good reviews and was, surprisingly, on the San Francisco Chronicle bestseller list in 1945. Adams’s anger still showed in 1965 when he offered the collection to the Library of Congress. “The purpose of my work was to show how these people, suffering under a great injustice, and loss of property, businesses and professions, had overcome the sense of defeat and despair by building for themselves a vital community in an arid (but magnificent) environment. . . All in all, I think this Manzanar Collection (209 photographs) is an important historical document, and I trust it can be put to good use.” The Library of Congress has collected these images under the title Suffering Under a Great Injustice. The Manzanar Camp was, somewhat ironically, just east of the Sierra Nevada Mountains where Adams spent so much of his photographic career. In the Manzanar photographs the Sierras, a modern symbol of freedom from the travails of urban life, appear as a distant backdrop to these images of incarceration. In 1988 the U.S. Congress apologized on behalf of the nation for the ‘grave injustice’ suffered by persons of Japanese ancestry. Congress declared that the internments were “motivated largely by racial prejudice, wartime hysteria, and a failure of political leadership,” and authorized a $20,000 payment to each Japanese American who suffered injustices during World War II. The prints in the exhibition were made by Paul Hess, to whom we extend our thanks. Images courtesy of the Library of Congress, Prints & Photographs Division. Leier is the only photographer to have had open access to this island, now a National Historic Site. Visitors now traverse the island on a tram, guided, with no freedom to roam. Earlier visitors were not so lucky. The official records from 1847, to pick one year, show that about 8,000 immigrants died (and were buried) at sea on the way to Canada and 5,424 died on the island itself. The cemetery on the island was the final resting place for many tens of thousands of immigrants. Still others died on the mainland, having been permitted to proceed. 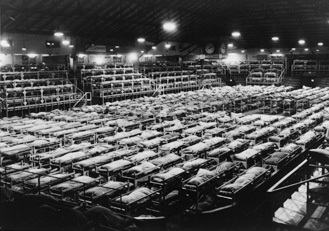 Use of its facilities as a quarantine station continued up to the late-1920s. In the mid-20th century the island was the site of Canada’s bacteriological research program, including research into the effects of anthrax. Leier’s photographs capture the somber mood of the place and are a cautionary reminder of the impact that our efforts to control populations can have on those we seek to ‘help’. An exhibition catalogue published by Presentation House Gallery includes reproductions of 30 of Leier's photographs and text by Anna Carlevaris, John Bryden, Eileen Leier & Bill Jeffries. In March 1942 the B.C. Security Commission was established to oversee the removal of all Canadians of Japanese descent from a 100-mile wide strip along the BC coast. Many were given only 24 hours to prepare. 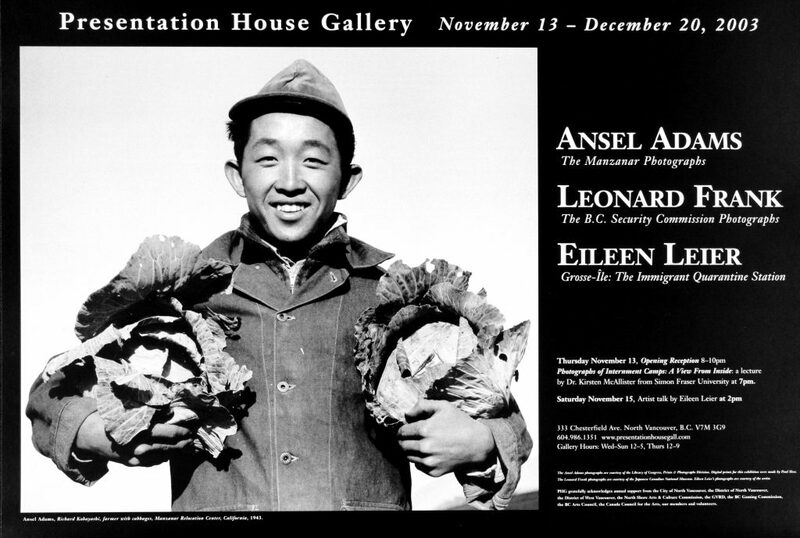 Just as Ansel Adams stepped out of his ‘normal’ role as a photographer to make images of the Manzanar Internment Camp, Leonard Frank was contracted as the documentary photographer of the BC internment. These photographs were donated to the Japanese Canadian National Museum by the family of Alex Eastwood, who was a member of the Commission. These photographs have never been shown as a group before and they give a different view of the internment from other images in other archives, as Frank had access to all the buildings on the PNE grounds used as an assembly site, including the interview rooms, and to all the camps in the interior. This exhibition is part of a three-exhibition analysis of internment, incarceration and quarantine mounted as an occasion to examine past incarcerations and to compare them with those of the present. Thursday, November 13 at 7pm | An illustrated talk by Dr. Kirsten McAllister from Simon Fraser University “PHOTOGRAPHS OF INTERNMENT CAMPS: A VIEW FROM INSIDE”. 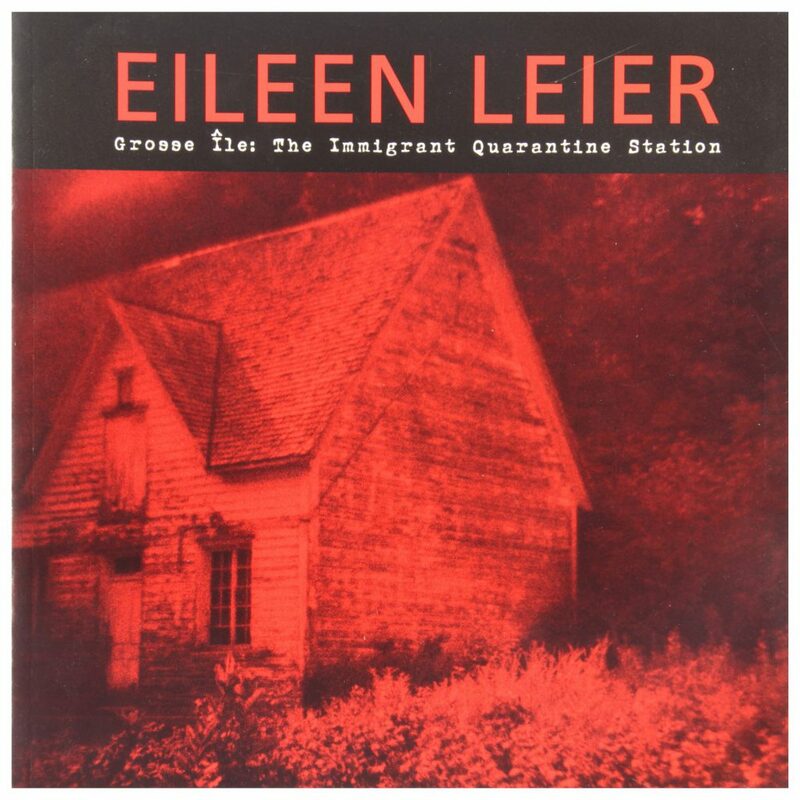 Saturday, November 15 at 2pm | Artist talk by Eileen Leier on several of her projects that re-visit key sites in Canadian history, including the Grosse-Île immigrant quarantine station. Followed by a reception for the artist. Leonard Frank, Building "E", Men's Dining Room (Formerly Industrial Bldg); Hastings Park, Vancouver (ca.1942) Courtesy of the Japanese Canadian National Museum. The 2003 exhibition and publication features Eileen Leier's photographic investigation of Grosse Ile, the island on the St. Lawrence River. This location was where immigrants from Europe seeking a new life were detained for medical assessment, prior to entering Canada. This was Canada's primary point of immigration from Europe in the 19th and early 20th centuries. Leier's photographs were shown in the context of two other exhibitions; Ansel Adams: The Manzanar Photographs and Leonard Frank: B.C. Security Commission Photographs. Curated by Bill Jeffries. Texts by Anna Carlevaris, John Bryden, Eileen Leier & Bill Jeffries. Catalogue designed by Catrina Longmuir and printed by Generation Printing.